Walking through the streets of Nairobi these days, you can be surprised by small groups of people sitting together, listening to somebody. If you get near, you will sometimes find that there is a street preacher trying to win some souls. But these days you will find more and more people involved in other type of discussion during rush hours and luch braaks. Kenyans are getting their civic education. 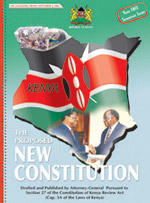 On 21 November this year, they are going to vote for a new constitution (downloadable as PDF-file).